7.55 points at 64 votes (rank 192). Hello! Anybody seen a ghost shortly? The fact is: yes! A whole lot of ghosts, which are on their way to fly to the infamous haunting headquarter. And you are now the only one who can avoid an apocalyptic-sized disaster. 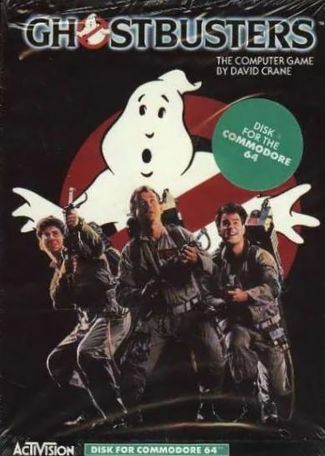 The player becomes chief of a "Ghostbuster commando", which is supposed to clean the town from a horde of cruel ghosts and close the "gate to the other world". The phantoms are attracted by the temple of Zuul. The mayor of this town entrusts you to investigate the paranormal appearances of the recent past and to eliminate the ghost threats for the inhabitants. With this mission and a seed capital of 10.000$ you tackle the task. The primary aim is not to rescue the city, but to make profit, i.e. to have more than 10.000$ capital at the end of the game (with a new account). Even when the town is taken over by demons, it doesn't matter. If the account contains enough at the end of the game, you can play the final. If you make it here to successfully clean the city, there is an additional bonus of 5000 $. First, the money is invested in nice equipment. You can choose between 4 different emergency cars, which differ in speed, loading capacity and -of course- in price. A VW Beetle is cheap and cute, but also slow and you cannot stuff much into it, a modified hearse has more power and space, but it is more expensive. Besides the car you also need money for various other junk, which you can buy as e.g. ghost traps (mandatory), ghost vaccuum cleaner or a Marshmallow Sensor. When you have stocked up, you can start. You find yourself in the streets of the town and you recognize a flashing house on the map, where a ghost is making trouble. So you get into your car and jet to that place. Arriving at the place where it all happens, you find a funny moving ghost you have to catch now. 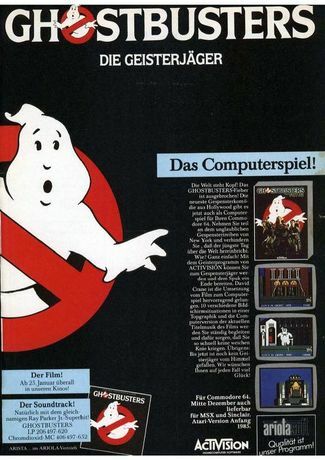 Therefore you put up the trap in the middle of the screen and to the left and right each one Ghostbuster switches on his energy beam and tries to lure the ghost into the trap. When you think the ghost is in the right position you activate the trap. But as the ghost doesn't follow any pattern it can also escape, whereupon it slimes onto one of the busters and then buzzes off. 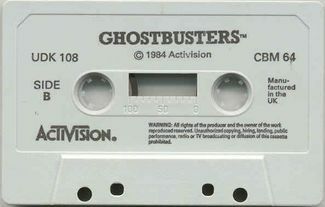 The second mistake you can make is crossing the two energy beams, which results in two disabled Ghostbusters. If you catch the ghost, you are rewarded some money. The whole game mainly goes like this, occasionally you have to go back to the HQ to get some traps or men or when the batteries of the energy beams are empty. You reach the end of the game when the paranormal energy of the town reaches 9999 points. This energy level starts at 0 and goes up constantly, at the beginning very slowly, then faster and faster. Towards the end the hazard that the highly popular Marshmallow-Man appears and floors a house grows. As soon as a Marshmallow alert flashes at the lower border of your screen, the strays are about to come together to form a Marshmallow-Man very quickly. Here the "Marshmallow Sensor" pays off. It warns you against the threatening approach of the horrible Marshmallow-Man by showing the building at your position in white. Press they key B as fast as possible to let go a bait, before it batters a building!! If the energy level reaches 9999 points and you have more money than you started with (with a new account this would be more than $10.000), you automatically drive to the skyscraper on whose roof the god of demons Zuul should be freed by the ghost powers (same as in the movie). To avoid this, you have to get to the roof. You reach the skyscraper with 3 men, the entrance is guarded by the Marshmallow-Man which jumps around in front of the door. Two of the men have to make it through the door without getting crushed, then the world is saved. If this fails the game also ends, but you won't get any money as bonus. If you ended the game with more than 10.000$ on your account, you get a code with which you can start the next game with more money. The graphics were very good for that time, later there were of course even on the C64 games which were optically significantly improved. 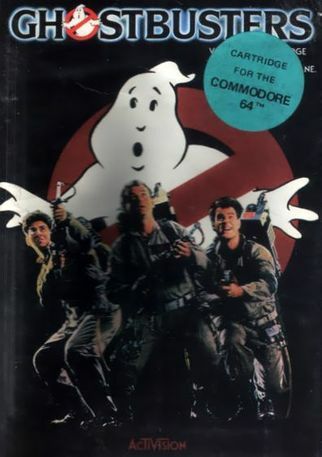 The musical accompaniment is the Ghostbusters song in infinite loop, additonally there are small effects and word samples - ("Ghostbusters", when pressing space in the intro and after catching a ghost, "He slimed me", when you fail trapping a ghost and you lose a man) - that was top at that time! Here you are offered four different cars to choose from. You can view the cars by pressing first the Space key, then entering the number (1-4) and confirming with Return . You can buy the cars by simply pressing 1 , 2 , 3 or 4 without pressing the Space key first. In some versions this has also to be confirmed with a press in Return . Compact $2000 75mph (120 km/h) 5 Items A small, slow, cheap VW Beetle. 1963 Hearse $4800 90mph (145 km/h) 9 Items The classical Ghostbusters car from the movie. Station Wagon $6000 110mph (175 km/h) 11 Items This cars offers the most space. High-Performance $15000 160mph (255 km/h) 7 Items Car suited for professional players, which are supposed to start already with a well-filled bank account. When you have bought a car you proceed to the menu for choosing your equipment. With the joystick you steer the forklift and load the desired equipment into your car. To change between the menues press the keys 1 , 2 and 3 . This must be confirmed with Enter in some versions. The amount of money that you have available is shown at the upper right on the screen, the price of each piece of equipment is shown to the right if it. As soon as you buy a piece of equipment, the amount is subtracted from your account. Menu 3 contains the portable laser confinement system (Storage Equipment). PK Energy Detector Warns you prematurely about approaching ghosts named "Slimer" by showing a building in purple when you pass it. The house will flash red shortly. Image Intensifier Makes the Slimed that you chase more visible. Marshmallow Sensor Warns you about imminent attacks from the Marshmallow Man by colouring the building, that you currently pass, white. During the Marshmallow Alert you have a tiny bit more time to lay down the bait. Ghost Bait Attracts straying ghosts that come together every now and then to form the Marshmallow Man. Without bait it is impossible to stop him. But you should take into account that the supply of bait is limited and only really use it for the Marshmallow Man. Trap Is used to catch the Slimers. You can buy several pieces of this equipment (until the corresponding car is loaded to the maximum). You have to buy at least one to be able to start the game. Ghost Vacuum Swallows straying ghosts that you meet on the streets of the city with a stylish sound. The PK Energy then rises more slowly and you have more game time. Portable Laser Confinement System This acts as having 10 additional traps that you can fill up before using your regular traps. You still must buy one regular trap otherwise the game will refuse to start. You can not see how much space you have left in the PLCS on the status screen, it only shows the regular traps left so if you have this plus 2 traps it will count down like 2-2-2-2-2-2-2-2-2-2-1-0. When you have bought all equipment that you need press the key E to get to the map of the city. This has to be confirmed with Enter in some versions. 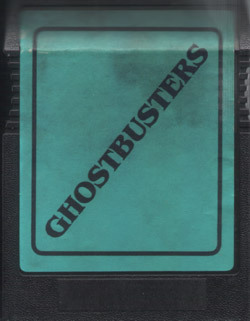 Direct the first Ghostbuster to the middle of the building and press fire to place the trap, then move it to the left to the desired place, face it towards the trap and press fire again. Now the second Ghostbuster appears. Move it to the right, turn it towards the trap and press fire. Both Ghostbusters now activate their portable negative energy beams automatically. 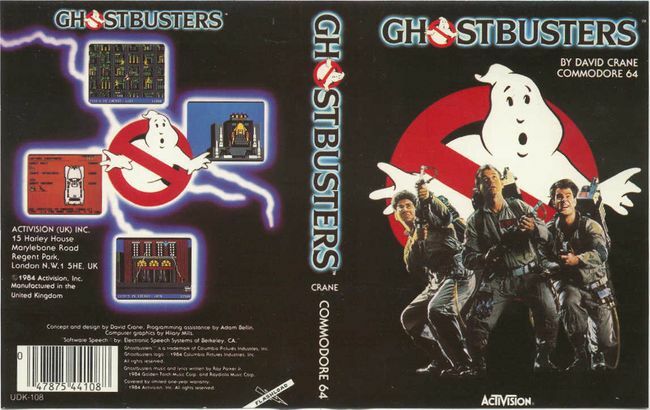 Then move your Ghostbusters towards the middle to catch the slimer in between the beams. But in no case let the beams cross each other. As soon as you hold the slimer above the trap, press fire. The trap will catch it. But be exact! You know what happens when you miss it. Every caught slimer raises your balance. The sum of your balance is always shown. When you plan your route to a haunted house well, you can catch the ghosts which go towards ZUUL on the street with the Ghost Vacuum (drive towards the ghost and press fire). This way you slow the building up of the ghost energy or the appearance of the Marshmallow-Man down. It is useless to go after the ghosts anytime before the meter hits 4000 as they are still too slow and you can catch around 3 or 4 ghosts at this time. When the meter starts going beyond 4000, hang right around ZUULs block and catch the ghosts at that point. Then wait for your next point of call. If you catch the ghosts while driving to the location, the ghosts will return to their starting point, and you didn't have to drive all over town. The most important appliance in the car: Ghost Bait. It must be activated by pressing B to stop Marshi every time it appears. The Marshmallow Man starts his role in the game when the PK meter hits 5000, and only shows once between 5000 and 5999, 6000 and 6999, etc. When you hit the button to catch the ghost, hover your finger over the B and then keep your eyes on the ghosts when returned to the map screen. Once they start moving off their usual course, and start moving quickly to form Mr Staypuffed, press the B. So long you hit B before the 4 ghosts turn into Marshmallow Man, you'll successfully bait the ghosts and earn your $2,000. Mr Staypuffed *CAN* show up if you stay on the map screen for long enough without catching a ghost. In front of the entrance to Zuul's temple a Marshmallow-Man jumps around. You need to place your Ghostbuster with the head in the middle, the backpack needs to be on the left. As soon as the Marshmallow-Man stamps on its left foot, walk into the door. During the game you can get a short status report anytime you press Space . You get shown the energy left in the protone beams as well as the number of traps and men ready for action. 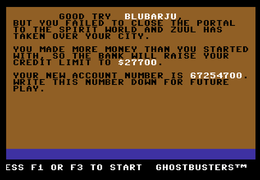 An online Ghostbusters bank account generator for C64 & MSX to make your personal bankaccount. Enter no name and account number 458 to get $1,000,000 (C64 only). Quote by Lemon64: For infinte money, enter ANDY as your name, then 777 as your account number. Shmendric: It also works with "INGO" as a name and "INGO" as account number - gets you a bit more than a million Dollars :) The snag is: You cannot accumulate more than $990.000 during the game and you have therefore no chance to win. 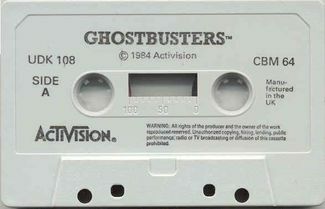 Guybrush: "Ghostbusters was really fun for a long time, especially when I didn't really have the hang of it. But if you do it unfortunately gets very dreary, because then it is too simple as you have to do without different levels of difficulty or multiplayer versions. Anyway, a diverting fun and therefore 7 out of 10 points from me." Shakermaker303: "It was not bad, although I never really had caught on everything in this game. I also never got to the end, but it was very entertaining anyway, rather diversified and you could hear nice speech output. Furthermore, the intro screen with music and superimposed lyrics was great, including pressing space bar to hear the classic "Ghostbusters". I also give here 7 out of 10 points." Blubarju: "A very successful and entertaining conversion of the movie. But by and by it gets a bit dreary. Until then fun is guaranteed. 8 points." Ragnarok: "One of the best software conversions of a movie, "Ghostbusters" transfers the flair of the movie through the speech output and fluent graphics. Crazy karaoke intro!" Shmendric: "A nice and entertaining game, which due to the account system animates to play it through several times. But I cannot really comprehend why it became a C64 classic amongst the games. I probably would have even played it, if it had been significantly worse, because in my young years I virtually adored the movie." The intro alone is up until now unique. 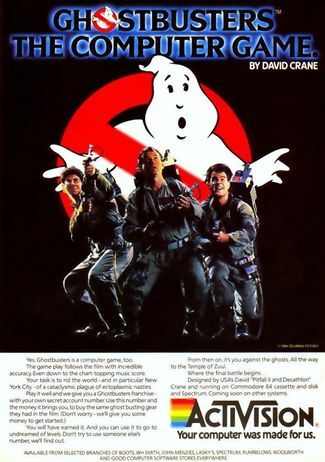 You see the Ghostbusters logo and the music of the megahit by Ray Parker Jr.is played (in the C64 format SID) and then the funny part starts: The lyrics are shown and over the text a small ball jumps which invites you to sing along. Which computer game has ever had an intro with karaoke? An ageless cool feature!!! If you press the SPACE key in the intro you get the speech output: "Ghostbusters!"